The Department of Chemistry and Biochemistry is housed in Coulter Hall, which was built in 1977, renovated in 2009 and 2015, and has over 100,000 square feet of floor space. It houses teaching and research laboratories, a machine shop, and a glass-blowing shop. The Science Library, housed in the Thad Cochran Research Center adjacent to Coulter Hall, contains more than 20,000 chemistry books and journals and subscribes to more than 140 chemistry research journals. The facilities are available 24 hours a day to our faculty and students. The Department of Chemistry and Biochemistry also benefits from the presence of several other on-campus research programs and facilities, including the Mississippi Center for Supercomputing Research, the National Center for Physical Acoustics, the National Center for Natural Products Research, and the School of Engineering. Some of the major research equipment located in the department is listed below. A Bruker DRX-500 equipped with broadband, inverse, and gradient capabilities, a Bruker AC-300 NMR spectrometer with proton and carbon capabilities for more routine applications. Both NMR systems are interfaced to an ethernet network for off-site data processing and analyses. ICP-MS the premier method for determining trace elements and isotopes in a wide-variety of environmental and biological samples because of its low detection limits, high sensitivity, wide linear dynamic range, and ability to measure about 80% of the periodic table. Our department is equipped with two state-of-the-art ICP-MS instruments both from Thermo Fisher: the Element-XR, a high resolution instrument capable of physically separating isobaric interferences, and the X-Series 2, a fast-scanning quadrupole instrument, which is often coupled to chromatography instruments for elemental speciation measurements. In addition, a laser ablation solid sample introduction system (UP213 from New Wave Inc.) allows spatial analyses down to a few microns. Cary 4 and Cary 2290 UV-vis spectrophotometers equipped with multisample programmable cell compartments and thermostated cylindrical cell compartments, a Cary 5 UV-vis-IR spectrophotometer equipped with a reflectance attachment, a Bruker IFS-66 FTIR spectrometer with a Graseby-Specac grazing angle accessory, an AVIV 62D CD spectrophotometer, an AVIV stopped flow CD spectrophotometer, and a Coherent 899 ring dye laser spectrometer with single-frequency scanning capability. ISS phase/modulation fluorometer, equipped with a 20 W argon ion laser, Perkin-Elmer LS-5B fluorometer, a Perkin-Elmer MFP-44 fluorometer, a diode-array based fluorometer (equipped for stopped-flow), and a laser light-scattering system. The Department has a number of chromatography and mass spectrometry systems, which are summarized below. Two Calorimetry Science Corporation Model 4200 Isothermal Titration Calorimeters (ITC) and a Perkin-Elmer DSC-4 differential scanning calorimeter and a DTA-1700 differential thermal analyzer and a custom built isothermal titration microcalorimeter. A Bruker AXS SMART 1000 single crystal X-ray diffractometer equipped with an LT-3 low temperature device. EG & G Princeton Applied Research Corp. Models 273 and 283 computer-controlled potentiostat/galvanostats, Pine bipotentiostat, equipment for rotating disk and ring-disk voltammetry and UV-vis spectroelectrochemistry. Digital Nanoscope III atomic force microscope (AFM). A JOEL scanning electron microscope (SEM) and energy dispersive X-ray spectrometer (EDS) are located nearby in the Department of Mechanical Engineering. 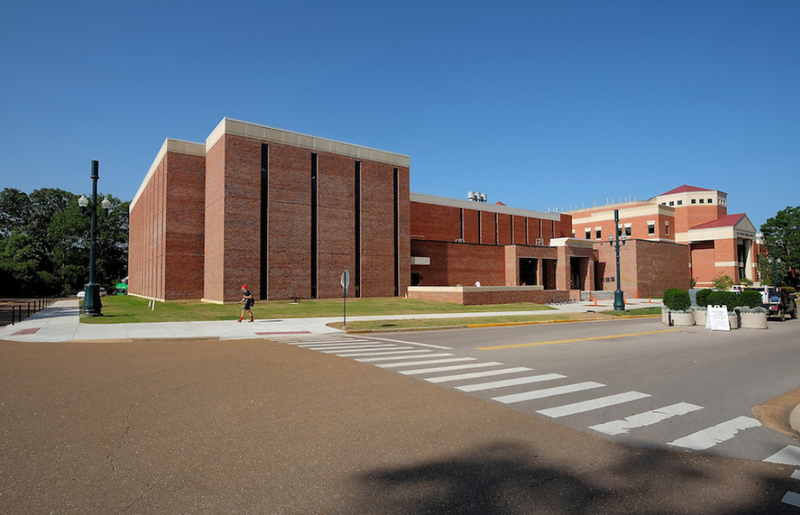 Faculty and students have free access to the facilities of the Mississippi Center for Supercomputing Research which includes several supercomputing platforms. Details can be found here (http://mcsr.olemiss.edu/supercomputers/). Other research equipment available in the department includes numerous glove boxes, an ultracentrifuge and several preparative centrifuges, a capillary electrophoresis system, a Pharmacia gene synthesizer, and an LKB DNA/RNA sequencing unit.